Just Another Day...: Take That, Panera!! You all remember the great bread bowl debacle of 2008, right? The one where two different Paneras were out of bread bowls on two different consecutive days? Well, let's just say those experiences have left a bad taste in my mouth (no pun intended). It's very frustrating to plan a meal and set an expectation around a delicious bread bowl only to find there are none. At this point, I'm not quite ready to tackle making homemade sourdough bread bowls from the comfort of my kitchen (I'm not very well versed in working with live active yeast). 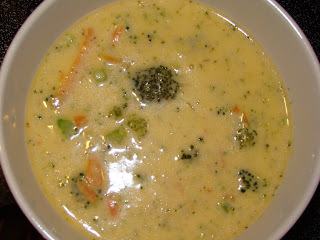 But I did decide to give our favorite Panera soup--Broccoli Cheddar--a shot from home. I actually made it about 2 weeks ago and It. Was. Awesome. I made it again for hubs and I tonight and thought I'd share this delicious gem with my blog reader(s). It's really a very simple recipe and doesn't require much skill in the kitchen at all! But it comes out so delicious that people will think you picked it up from your local Panera on your way home from work! Add salt and pepper. Purée half of soup in a blender. Return to heat and add cheese. Stir in nutmeg. Continue to cook until cheese is nicely melted. Serve hot!